Promising duo Aaron Smith and Josh Eaves have both signed one-year contract extensions with St Helens. The Academy products have each agreed a one-year deal, with the option for a further year in the club’s favour. Smith, 21, made his first-team debut in Saints’ win over Catalans Dragons in Perpignan earlier this month and has also spent time on loan at Hull Kingston Rovers well as playing for York City Knights and Featherstone Rovers on dual-registration this year. The England Academy international has been at Saints since he was 11 after playing his junior rugby at Blackbrook Royals. 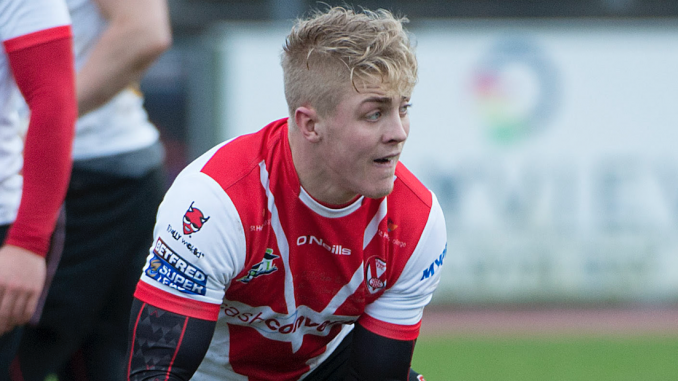 Eaves, 20, has yet to make his debut for Saints but has impressed in League 1 this year while playing for Whitehaven on dual-registration. He works closely with Saints’ Community Development Foundation and came through the ranks at Clock Face Miners. On Eaves’ extension, Holbrook added“Josh is following in Aaron’s footsteps and to have both of those players competing hard for future years is fantastic.